The Toughbook range has been a big success for Panasonic, and it has seen its name become the world's leading manufacturer of rugged notebooks. 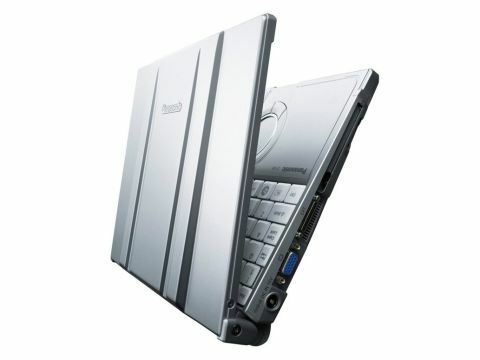 Despite the Toughbook brand being synomonous with giant three-inch thick notebooks which can survive being driven over by tanks, bombed or shot, Panasonic is aiming its new Toughbooks at ordinary consumers instead of the construction and defence industries. This has led to a huge reduction in size, weight and looks, and this explains why the new CF-W8 can blend in amongst most business notebooks. The W8 comes in an attractive silver, and there's no sign of those cramped keys and woolly, unresponsive track pads. The mouse pad is wonderfully responsive and keys are comfortable to use and type, even if a few common keys are inexplicably small. The W8 features a Centrino 2 SU9300 Core2 Duo 1.20GHz processor, 3GB DDR2 RAM and a 120GB SATA hard drive all in a chassis which weighs a mere 1280g. Integrated HSDPA is an optional extra, which will put an extra £100 on the base price. However, more importantly for a Toughbook the rugged frame is drop resistant up to 30cm, has a spill resistant keyboard and can take up to 100KGs of pressure exerted on the lid. While the CF-W8 won't be stopping any bullets, it's designed to give the performance of a standard laptop but withstand crushes in the luggage compartment of public transport and the careless handling which costs thousands of laptops their lives every year. With this impressive array of rugged features, we took it upon ourselves to put them to the test. The first test was the drop protection. The methodology was simple- play a video and then toss the Toughbook off the desk, a task which requires more bravery than you might imagine. The W8 hit the floor on its reinforced lid, a landing which would have killed many a laptop, but all that happened was the video stopped playing momentarily before starting again. Success. Next came the spill resistant keyboard, and even more balls required here. The W8's main board is sealed off underneath the keys so that when liquid is spilled it simply drains out of the bottom, and there's no need for disruption. A good dry was all that was required to carry on with the test. Of all the ruggedized features it's the reinforced lid which is the most important. Any hardened traveller will know how flimsy the area between a laptops screen can be, and pressing down gently often puts intolerable pressure on the LCD panel. There's no such pressure on the W8, and the weight of a hefty TechRadar size 10 was no match. The laptop we reviewed had been downgraded to Windows XP, which positively sang on the Toughbook's impressive specs, and we're sure that Windows Vista Business, the standard operating system, wouldn't have any problems either. Unlike the performance, we did have a problem with the screen. Panasonic say that their customers don't want 16:9 widescreen displays and that means that all Toughbooks ship with the old square 4:3 aspect ratio. This means that there's very little room on the W8's desktop and has a maximum resolution of just 1024x768. There's no doubt that the CF-W8 is a great machine and it's truly a Toughbook for the common man. However, the £1,700 price tag means that you'd have to be either extremely active or equally clumsy to fork out. The Toshiba A600 is almost identical in terms of hardware and costs just £1000, you'll need a very good reason to fork out the £700 for the toughened chassis.